I've found my forever home! Hello. My name is Elton Brown. 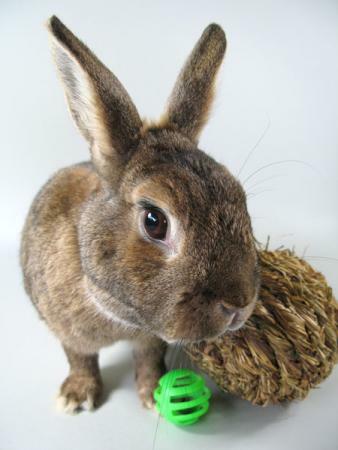 I am a very cute, neutered boy with an adorable, chubby little face and big brown expressive eyes. My human passed away and I ended up at an animal shelter because her family was no longer able to care for me. I am a sweet boy who is eager to find my forever home. One of my favorite colors is blue, so here I am posing with a striking blue and metallic gold fused glass dish made by Marcy here at SaveABunny. Did you know that proceeds from the sale of SaveABunny's artwork goes directly to help rabbits in need? Well, it does! There is so much beauty here at SaveABunny...me, the artwork and all the loving, deserving rabbits. Please visit us soon!